Panna Cotta is very simple and easy to make. It's a rich and creamy dessert which is perfect for a hot summer day. If you want something sweet but don't want to go through all the hassle of making it, you should give this recipe a try. I like a strawberry topping to go with this tasty dessert. In a bowl, mix gelatin with 1/4 cup of half and half cream. Set aside. In a saucepan, stir whipping cream, the remaining half and half cream and sugar together over medium heat until it is about to boil. Turn down the heat immediately before the cream mixture rises. Pour the gelatin mixture into the cream mixture, stir constantly until completely dissolved. Pour into six glasses. Allow to cool. In a saucepan, simmer puree strawberries and sugar over low heat. In a small bowl, combine corn starch and water. Stir until no lumps remain. Add the corn starch mixture to the simmering strawberry mixture and stir until thickens. 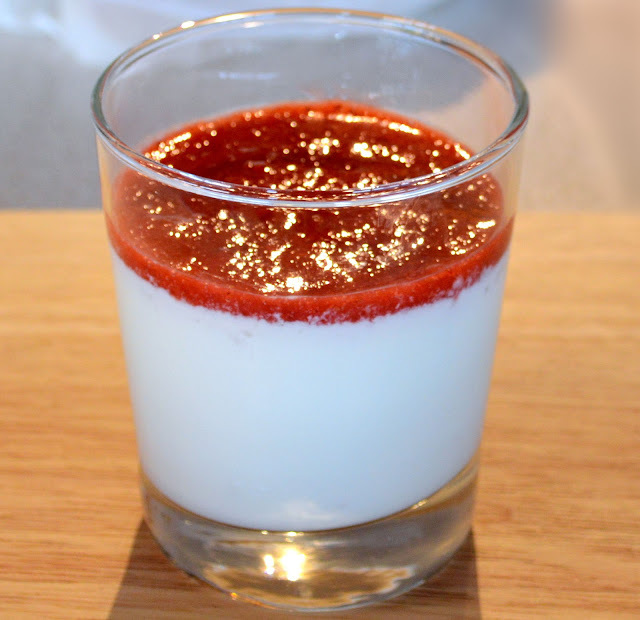 Put the strawberry mixture on top of the Panna Cotta.